We were delighted to be part of The Gathering, hosted by SCVO at the SECC in Glasgow. Not only did we have an exhibition stall for the two day event but we co-hosted a workshop with Social Enterprise Scotland called A Practical Guide to Driving Social Enterprise Activity. Our panel comprised three guests all with different experiences of social enterprise - Selina Hales from Refuweegee, Stephen McLellan from RAMH and Anne-Marie Treacy Deaf Connections - who all generously and openly shared their experiences of the ups and downs of leading charities which generate some of their income through trade. As Social Enterprise Scotland CEO Chris Martin pointed out, 75% of social enterprises are also registered charities so the sometime perception that you are either one or the other is a fallacy. Certainly, in our work at CEIS we see more and more charities that are looking to complement their traditional fundraising activities with more enterprise related income generation, whether that’s to improve sustainability, provide employability solutions or generate a steady stream of income that doesn’t have to be tied to project outcomes. You won’t be surprised to hear that none of our panellists started enterprising activity purely because they wanted to make money. For RAMH, who now have a huge reuse superstore in Johnstone, the idea was born from a service user asking for help, while Refuweegee wanted to spread awareness of their project and allow people to physically show their support for the ‘refugees welcome’ message through a range of t-shirts. Perceptions. From Board to staff, service users to customers, everyone will have a view on what the purpose of your organisation is and moving towards charging for services or products can feel like drift to some people. Risk. Enterprise is by it’s nature risky - you have to speculate to accumulate and all that jazz - and managing that risk goes a long way to minimising the impact of any potential pitfalls. Skills. The people who have guided your charity thus far might not have the skills (or desire) to lead any enterprising activity. And even the people who really do see the value of the enterprise might not have the all the relevant skills. Employment and Volunteer Opportunities. If you have your own business in house you can offer training and paid employment to the people who use your service. It can prove a safe and supportive space to practise real work skills allowing people to earn money as well as grow in confidence. Awareness and Reach. 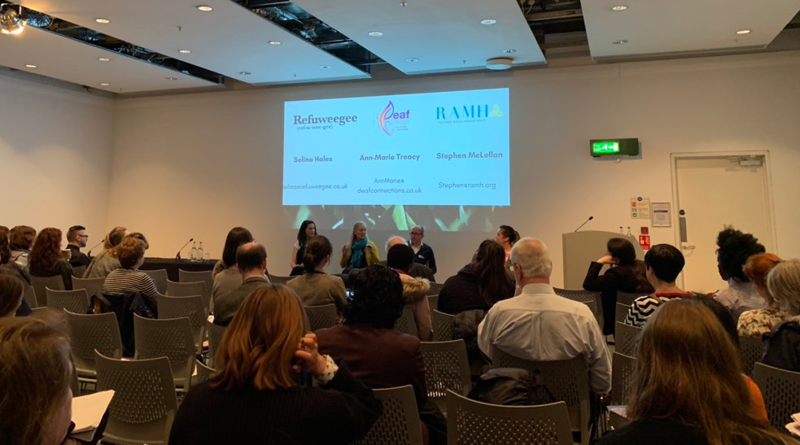 Stephen McLellan of RAMH pointed out that not everyone will feel comfortable visiting their GP or otherwise raising their hand to ask for help when it comes to mental health, but popping into a shop and picking up a flyer doesn't seem quite so intimidating. Anne-Marie Treacy from Deaf Connections also notes out that opening their building and services to the general public is helping to reduce barriers between the deaf community and their local community. Finally, the Refuweegee T-Shirts and “Trump is a jobby” badges Selina’s team sells are a great conversation starter for the important issues they are trying to tackle. Providing Services. Sometimes, the sad reality is that charities aren’t able to provide all the services that they want to, but subsiding costs through enterprise can make the difference between staying afloat and shutting the doors. Deaf Connections have had a number of different income streams for many years almost exclusively serving the deaf community. Now, they open their cafe, event space, theatre etc to the wider public they are far more confident that they will still be able to offer vital services to their service users for many more years. Improving Services. As a social enterprise, you will be reinvesting all your profits back into your services or community. This means that you can focus on doing the best you can, without worrying about shareholder value. An upshot of this is the focus on delivering the best quality service that you can. It’s not to say that mainstream businesses don’t care about quality, they clearly do and we’ve all had some wonderful customer service experiences in the private sector, but social enterprises are really, really good at realising wider benefits. To use Deaf Connections example, they provide BSL interpreters and by their continued reinvestment they have improved the working experience for interpreters, employing and training more (as opposed to the freelance contracts standard in the industry) which means that their team aren’t thrust straight into complex or emotional medical or legal assignments straight away. This approach benefits the interpreters, the people they are working with and the professionals who are depending on them to convey often challenging messages. Community. Often, by providing services of products you are able to be part of your wider local community in a different way to before. So what where the lessons we learned on the day? Use the support available. CEIS have worked with both Deaf Connections and RAMH many times over the years and our business experts are able to work with Boards and charity leaders to help them assess the best way forward, whether that’s feasibility studies and scoping, income generation ideas, costing and pricing, business planning and strategy, marketing or board reporting. Understand your Why. If you feel forced into generating income solely because your grant funding is reduced it probably won’t work. People working in social enterprises often need a bigger why than ‘because we need the money’! Look at Alignment. Consider if you would prefer to stay in your comfort zone in terms of the services and products you already deliver or whether something completely different would be better. People. Make sure you have the right people in place. Often organisations opt to create a sub committee from their main board to guide the enterprise activity. If you are interested in understanding how CEIS can help your charity explore enterprise please contact us. You might also benefit from attending some of the fully funded workshops available at www.justentprise.org. Whew! That was a quick month. We closed on Christmas Eve so the team worked hard to see all of our clients and ensure projects stay on track.